This entry was posted in Movement Building & Support on July 23, 2016 by Deep Green Resistance Wisconsin. 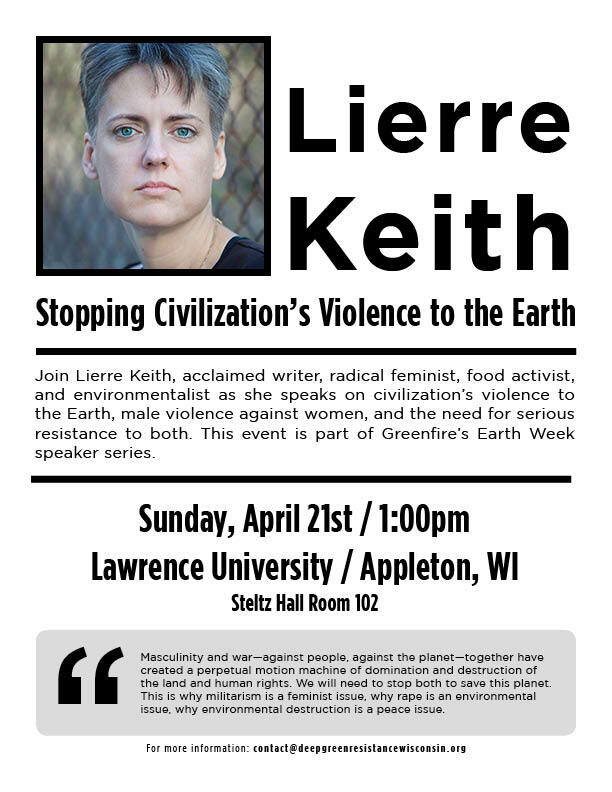 Join Lierre Kieth, writer, radical feminist, food activist and environmentalist as she speaks on civilization’s violence to the earth, male violence against women, and the need for serious resistance to both. This event will take place at Lawrence University (Steitz Hall Room 102), located at 711 E. Boldt Way in Appleton, Wisconsin, on Sunday, April 17st starting at 1:00 p.m. This is a free event and is part of Greenfire‘s Earth Week speaking series. Members of Deep Green Resistance from across the region will be in attendance and staffing a booth which we encourage you to stop at to pick up literature and learn how to get involved in our efforts. This entry was posted on August 26, 2015 by Norris Thomlinson. Saturday, September 24th, 2011. 12pm-3pm. As the destruction of the planet continues, we need to begin organizing and building resistance to match the scale of the problem. This is the first meet-up for Deep Green Resistance Wisconsin. On this day we will, together, discuss and chart a course of action for our group. If you are involved with DGR, or interested or considering becoming involved, please join us for this meet-up. Future event ideas: Hosting a weekend-long DGR conference; END:CIV film screenings; webcam conferences with Aric, Lierre, or Derrick; DGR book discussion clubs; landbase defense and restoration; any points you who are attending would like to bring up. Keeping questions like these in mind, we will, as a group, chart a course of action for the future. At this meet-up, we’ll continue our conversation about organizing events, campaigns, and actions to stop civilization from killing the planet, and how to create the organized resistance movement necessary to be effective. If you are involved with DGR, considering becoming involved, or just interested, please join us for this meet-up. Deep Green Resistance is hosting a new Wisconsin membership meeting Saturday Dec. 3rd to introduce the community to their grassroots environmental movement. The goal of Deep Green Resistance is to deprive the rich of their ability to steal from the poor and the powerful of their ability to destroy the planet. DGR analyzes previous resistance uprisings throughout history, and offers a concrete method for how to stop the destruction of industrial civilization. Join DGR at Rainbow Books at 12 pm on December 3rd for an outline of their action plan, with a question and answer session to follow. Sunday, February 19th, 2012. 2pm. Sweetwater Organics, 2151 s. Robinson Ave. Milwaukee, WI. Deep Green Resistance Wisconsin is hosting an “Introduction to Deep Green Resistance” event to introduce the community to their grassroots environmental movement. The goal of Deep Green Resistance is to deprive the rich of their ability to steal from the poor and the powerful of their ability to destroy the planet. DGR analyzes previous resistance movements throughout history, and offers a concrete method for how to stop the destruction caused by industrial civilization. Join members of the Wisconsin chapter of the Deep Green Resistance movement as we outline our plan of action, and offer a question and answer session to follow. On Tuesday, February 7, 2012, the Madison Infoshop Collective will be hosting a workshop and discussion on Security Culture and its role in progressive and radical movements. The workshop will include discussion on security culture’s role in more recent Midwest activist history, and a discussion of ways in which above-ground movements can minimize security breaches while working effectively toward their goals. The workshop is open and free to the public. The event will go from 7:00pm until 9:00pm. For more information about Security Culture, please visit the Security section of this website. Deep Green Resistance Wisconsin is co-sponsoring this event with Madison for the Penokees. Proceeds will support the efforts to stop the proposed Penokee mine. Where: Revolution Cycles, 2330 Atwood Ave. Madison, WI. Derrick Jensen will be interviewed on WORT 89.9 FM at 12pm (central). Listen live here. This radio interview is happening in conjunction with and support of his speaking event happening later in April, on Tuesday, the 17th, at the University of Wisconsin’s Varsity Hall (inside Union South), located at 1308 W. Dayton Street in Madison, Wisconsin.